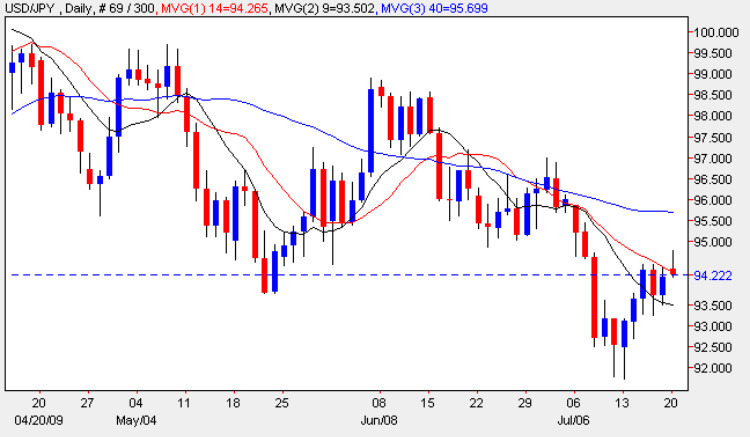 The yen to dollar pair continued to validate the tweezer bottom outlined in last week’s market commentary, pushing higher once again on Friday, and ending the trading session with an up candle which found support from the 9 day moving average, but which failed to penetrate the 14 day average indicating the fragile nature of the daily chart at present. As we approach the strong resistance above, I would advocate extreme caution in trading the dollar yen higher at this stage, as any further move will require a huge effort if any significant progress is to be made, and in my opinion we may well see this move falter in the short term, with a collapse back lower once again. The 40 day moving average may well prove pivotal, and the Japanese markets closed today for a national holiday, I would suggest you step aside from trading the dollar yen, and look elsewhere for other trading opportunities in other currency pairs, which have a lower level of risk and better profit potential. For the US dollar, the fundamental news today is very thin, with only one item on the economic calendar, namely the CB Leading Index, a composite of old data which has little market impact as a result.